If there’s one thing I could name about being a Catholic that carries me through it all it would be the emphasis Catholicism puts on suffering. I grew up in some great, lovely, uplifting denominations yet as I grew older they didn’t carry me through the way I had been taught they would. I got older and life got harder. Careers and jobs didn’t work out, the economy tanked, relationships were not what I thought they were and many, many times I lost my own footing as I tried to discover who I was. Relatives got older, friends got sick, the world turned upside down and the little world I encompassed on a daily basis was full of more questions, dark moments and struggles than it was full picturesque faith. When I was in the process of discerning conversion to Catholicism I knew my soul was crying out for more than happy Bible studies and fun music. 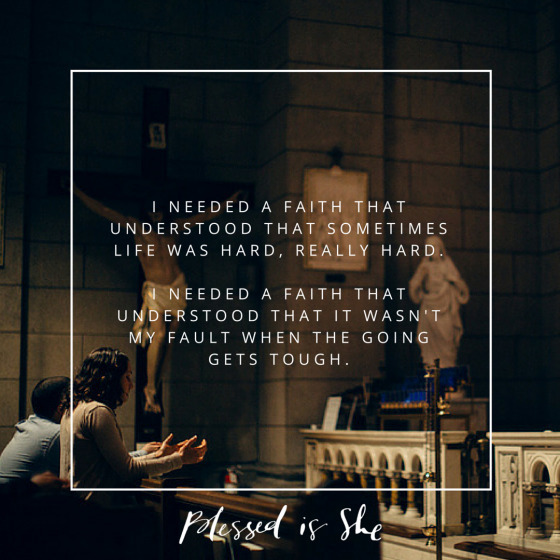 I needed a faith that really understood that sometimes life was hard, really hard. I needed a faith that understood that it wasn’t my fault when the going gets tough. I needed a faith that didn’t see my life’s lack of perfection as a reflection of my relationship with God or as a photocopy of the state of my Soul. In today’s reading, we get some of the New Testaments most quoted lines; lines full of support and happy promises. Yet it was not until the last few years that I realized there’s more to read between them. A younger version of myself would read these lines and see them as a promise that everything was going to be okay—those bad times would end or that I’d finally make that right, ideal decision—but that’s not what’s there. We’re not told to avoid the bad times. Saint Paul is not told to give up and do something a little less difficult. We’re told to keep going, to do the hard things, to live the hard times because in the end God delivers us to His best reward. Our reward is not to be free of hard times here on earth; it’s not a sign of favor to have an easy, “blessed” life. Our reward comes at the end of these long days and what we need is to remember that not one of us is asked to live the easy life, not even Jesus and His blessed Mother escaped this world without their share of hard times. Today remember that we here at Blessed Is She see your hard times; we’ve been there, we are still there, we’re walking that road beside you. Your hard times are not a sign of weakness or ill-favor. Your hard times are not a reflection of your family, your child, or your soul. Your hard times are a painfully beautiful part of how God is calling you to him. Remember we see your hard times; we’ve been there, we’re walking that road beside you. We are here, and we have the Church. God blesses us with His grace during all times. Molly Walter is a wife, mother and homemaker (with a pesky job outside the home). She shares about making the life she wants with the life she’s been given over here.